Magnolia ‘Ricki,’ Yellow Ribbon Arborvitae, Blue Chip Juniper in a front bed I’ll never finish. It’s early May, and I’m gardening at my house, clearing out, by hand, last fall’s leaves that are cuddled deep around the bases of my shrubs. The wet, matted leaves block the air from circulating freely around the base and block the sun’s rays from sterilizing the soil. 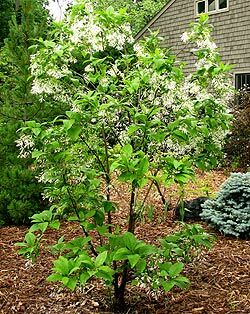 I do it to every shrub, evergreen and deciduous. It takes time. But I love my shrubs, they are so darn healthy and pristine. They are so healthy and pristine because each spring since planting, I have cleaned out around their bases. Some of the shrubs are twenty years old. 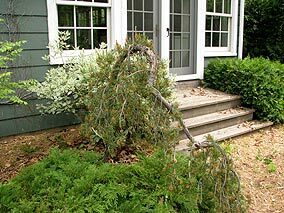 Next I turn my attention to pruning, and work from small tree to shrub, deftly removing any dead branch or twig that gave up the ghost over winter. I gently sift through each soft branch of my dwarf, blue shag white pine. I find only two small, dead branches, deep inside. Every year I have pruned out the deadwood—seven years now? Whenever it was that I tore out, redesigned and replanted the entire front foundation bed. It may be the only blue shag white pine in Minnesota that goes about life each year without a single dead branch or needle. It was tiny when I planted it—I bought it in a number three container, the larger ones had thin and broken base branches. It was perhaps 12” x 12”. My, how you have grown..
Blue shag pine (foreground) at the Renegade Gardener’s front door. 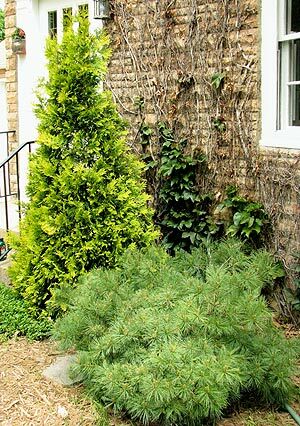 What’s also grown remarkably larger is my original dwarf blue spruce, Picea pungens ‘Globosa.’ I planted it so long ago, they weren’t common. Now one sees them everywhere, but I never tire of them. Cleaning it of the dozens of leaves, maple seeds, and acorns that lie tucked into the dozens of layers of tight branches takes a good twenty minutes, but when I’m done, it is pristine. The ninebarks, fothergillas, pagoda dogwoods, my wonderful Chionanthus virginicus (Fringetree), my gorgeous redbuds and my handsome Arnold Sentinel pine, I deftly work on each and all. Arnold, my goodness, you appear to have grown another ten inches last year. 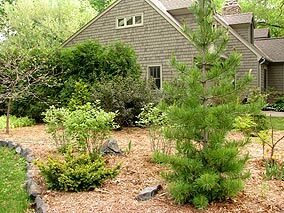 But the tree is so stoic and slender, even at maturity the base branches will brush barely outside the Wisconsin trap rock I so carefully fitted together when creating the curving raised bed. They all get watered and clipped and cleaned. I work slowly, quietly. I haven’t been able to spend this much time working in my landscape in over three years, ever since I moved out. I’ve never published sprawling, broad pictures of my gardens and landscape on this site. I’ve used plenty of close-ups, sure, perhaps one hundred, individual plants, foliage combinations, particularly from the flower gardens. But never grand vistas of what I tried to create at my home. Because it was never finished. 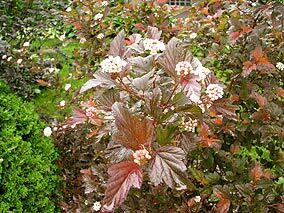 I never added the perennials to the shrub framework. I got divorced instead. 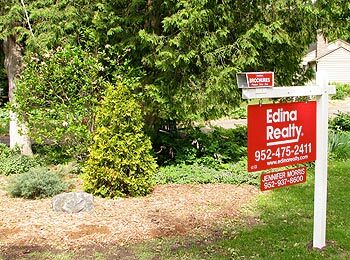 We agreed to hold onto the house for four years until my son graduated high school, and my wife lived there. My son, Elliot, graduated two weeks ago.And now I’m trying to make the landscape sparkle for the first open house, just one week from now. Probably a good thing I never added the perennials—300 or so—because the house wouldn’t be saleable. Not unless the prospective buyer was a helluva gardener.So instead of planting perennials I’m spraying Roundup, gallons of it, on the thousands of weeds that have taken over since I’ve been gone. 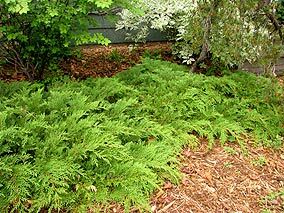 The back yard is a briar patch, skunkweed, thistle, creeping Charlie, weeds ranging from one inch to six feet tall having taken over in wave after wave. A few times a year I get pissy e-mails from Monsanto activists, irked that I have an article on the site that says it’s OK to use a little Roundup, that it isn’t the child-maiming poison the extreme environmentalists erroneously claim it to be.Now I have to knock down sixty millions weeds growing over a half-acre yard in order to sell a house that desperately needs selling. My former spouse lost her job in January, we’re trying to send a kid to college, our financial situation is tight, the house has dropped $80,000 in value, we’ve spent two months and $15,000 getting it ready for sale … so I spray Roundup. What would you have me do, California landscape designer who scolded me for not telling people they should boycott Roundup? What would you have me do? I’m only one guy. Not even California has enough gainfully employed illegals to weed this mess by hand in a week.Uncle Fogey looks grand. He should, I moved him three times before I got him in the right spot. In fact, all the trees and shrubs look grand. My son and I have spread 25 yards of mulch, the neighbors are relieved that the Renegade Gardener’s yard is no longer an eyesore. They tell me, in fact, how great the property looks. But I see what isn’t there, know what could have been, and understand perfectly what never will be.